This work by Mawurndjul concerns a major patrimoeity ceremony of a secret and sacred nature called Mardayin. Much of the meaning of the iconography in the painting is not in the domain of public knowledge and so it cannot be explained in detail here. "Yoh Milmilngkan maneh yina kunronj manekke mane yi-na. Ka-bo-bebme. Djal njamed 'spring'." Yes, this is the site at Milmilngkan and these represent water, you can see here. The water comes out [the little round dots are water/springs]. They are springs. "Kam-borrolkan Milmilngkan kunred but manekke njamed ka-karrme man-djimdjim spring kunronj kam-bobebme. Ngalyod might be kanjdiji mayh ka-yo ngalyod. Mani rarrk nga-bimbom. Kunred manekke. Kuning ka-yime bonj ka-borrohdolkan nga-nang boyen." The water comes out at Milmilngkan and there are springs there surrounded by water pandanus (Pandanus aquaticus) where the water comes out of the ground. This might be caused by rainbow serpents which live under the ground there. This is all cross-hatched here. The cross-hatching represents the country there. That's what happens there, I've recently seen the water coming up out of the ground there. NOTE: Milmilngkan is another of Mawurndjul's seasonal camps where he has a house there on the edge of a small creek. Signed l.r. 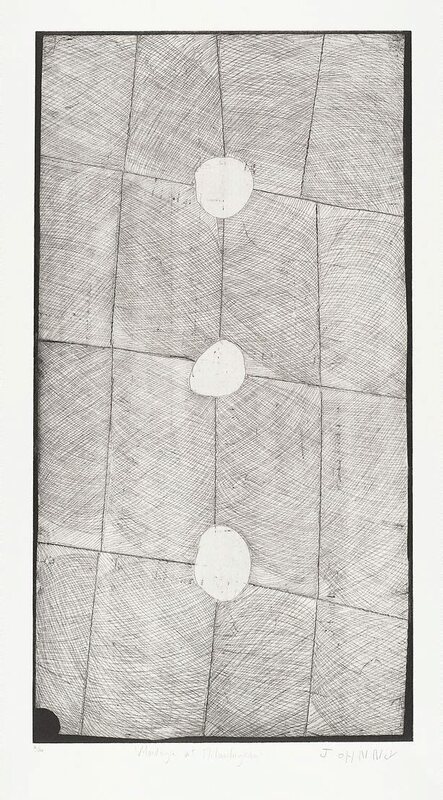 beneath platemark, pencil "JOHNNY". Not dated.